Modern / Contemporary bespoke fitted kitchen designs that represent the trends of today can be grouped into two categories: Modern and Contemporary. 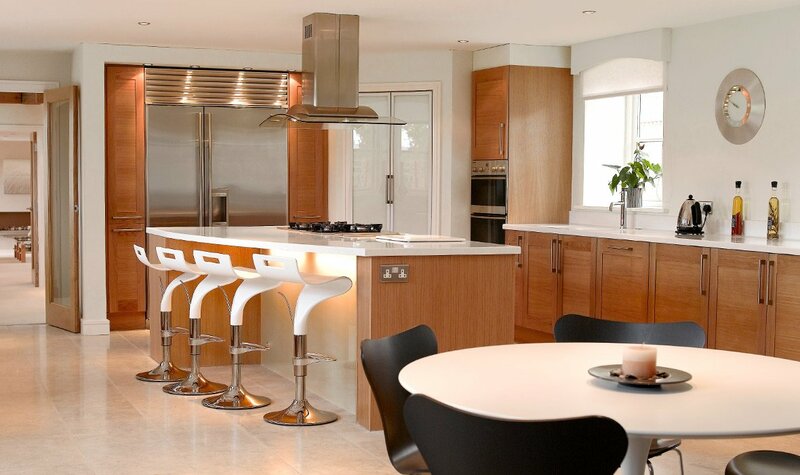 Modern and Contemporary bespoke kitchen designs have many features in common. For Example, they both maximise the use of light to create a brighter and more open ambience to the room. They would also avoid some of the more traditional design features such as plate racks. Modern / contemporary fitted kitchens would have an up-to-date selection of appliances and accessories and would have a normal range of wall cabinets. The handles would be simply shaped and plain in colour. When combined, all of these attributes help the modern fitted kitchen stand the visual test of time. Contemporary fitted kitchen designs go a step further. They usually have very plain flat panel doors and employ familiar materials such as glass but in a more cutting edge way i.e. as the worktop material. The appliances selected would typically be frameless and touch control because they have less visible detail, even the cupboard door handles would be sleek or handle free. There is often a deliberate absence of wall cabinets which really enhances the minimalist impression. Our designers have the required knowledge and experience to turn even an ordinary room into something quite extraordinary. To find out more about what will transform your kitchen and still work in conjunction with the rest of your home, please ask for a free consultation with one of our design team. We have a stunning range of modern contemporary gloss & matt finished doors in our modern fitted kitchen range and specialise in modern and contemporary fitted kitchens in Southampton, Hampshire, Dorset, New Forest and Winchester.